roasted peppers with tuna and salsa verde? spinach cheese soup with prosciutto? pumpkin gnocchi w/brown butter and sage? ricotta gnudi with tomato sauce? pistachio panna cotta w/ chocolate-marsala sauce? It is, as you may have guessed, my Christmas menu. Or what will become my Christmas menu once I’ve figured out which of the above I actually intend to make. Like last year I’m going for a long, drawn-out and recklessly indulgent Italian affair; unlike last year, at 72 hours out (actually more like 68 hours) I’m still sitting with a stack of cookbooks and weighing the merits of soup vs gnocchi, creamy pork vs tangy rabbit. You see all the question marks? Those are the dishes I still have to decide on. And many of them have multiple versions I’ll need to decide on once the dish decisions have been made. Have I mentioned I’m a double Libra, and making decisions is antithetical to my nature? Well, at least two things are decided already: pâté and meatballs. I made them both last Christmas, and both were so incredible I’m breaking my own no-repeats rule. It’s funny, normally I would rather jab swizzle sticks in my eyes than eat the same thing two Christmases in a row. I can’t even count the number of times I’ve announced to anyone within earshot that there are simply too many exciting new special-occasion dishes waiting to be discovered to waste precious time, effort and stomach space on food I already know. Don’t I feel silly now. In all fairness, though, these are two repeat-worthy dishes, not only because they’re so good but because they’re rich and extravagant and seem tailor-made for a special meal like Christmas. The first is this pâté—but you already know about it, so I won’t waste any more breath trying to convince you of its merits. The meatballs, however, I’ve been hiding like an ace up my sleeve since last Christmas. I served them as our main course, and they were—despite the fact that their preparation was accompanied by major trauma when a certain spouse of mine got so frustrated trying to de-bone chicken thighs that he threw my beloved Global vegetable knife into the sink hard enough to break the tip off the blade—such a hit that I literally have not stopped thinking about them since (of course it doesn’t help that every time I look at my sad, tip-less knife I’m instantly reminded). As meatballs go they’re pretty far out there, full of non-meatbally stuff like chicken thighs, salami, candied citron, spinach, cinnamon, almonds and cheese. In all honesty I had my doubts that this strange collection of ingredients would result in anything edible let alone earth-shattering, but that just shows you how little I know. Luckily I know enough to blindly trust Lynne Rossetto Kasper, who in matters of taste has quite literally never steered me wrong. They appear in her lesser-known book The Italian Country Table, where she reports that she got the recipe from a friend of hers in Puglia named Rina Durante, who herself inherited the recipe from her grandmother. In Puglia, she reports, they’re eaten on special days like Christmas, Easter and as the name of the recipe indicates, on St Joseph’s Day, the holiday in the middle of Lent when everyone’s allowed to recharge their piety batteries by indulging in everything they’ve been missing. I can just see those little Pugliese grandmothers, trying to cram everything forbidden during Lent into one dish—meat, sugar, cheese, wine. Somehow it all works, though, and all the various contrasting elements come together into something much more than the sum of its parts: festive, flamboyant and epically, tradition-inspiringly delicious. And with that I would like to wish you a very Merry Christmas, dear readers. May your houses be warm, your spirits high and your tables groaning under the weight of good things to eat. And while we’re on the subject of tables, if you have a minute to spare I’d love to know some of the things that will be featuring on yours. Last Christmas I served these as a hot main course with a side of roasted cauliflower; this year I’ll set them out at room temperature as an antipasto. They’re absolutely perfect either way. They can also easily be tweaked; if you can’t buy skinless, boneless chicken thighs (and don’t feel like boning your own, an endeavor I would approach with patience and a very sturdy knife) you can substitute pre-ground chicken or turkey; lean ground pork would probably also work in a pinch. If you have trouble tracking down candied citron, don’t fret; either substitute candied lemon peel or go for something like currants or golden raisins (sultanas). p.s. The original cheese called for in these is something called fontinella, which seems to only be available stateside. Since asiago is listed as a good substitute, I inferred that parmesan would also be one, so that’s what I’ve been using. If you can find fontinella, though, go ahead and substitute an equal weight. Serves: 3 to 4 as a main course and 6 or so as an antipasto, but consider doubling the recipe as they always go faster than you think (not to mention make delicious leftovers)! In a food processor, mince the garlic and salami into small pieces. Add chicken thighs, spinach, onion, salt, pepper and cinnamon and process until very finely chopped. Turn everything into a bowl. Blend in bread crumbs, cheese, almonds, and the egg until well mixed. Check the seasoning by sauteing a little patty of the mixture until firm, then tasting. Add more salt if necessary. Shape into 2-inch balls. Pour a sheer film of oil over the bottom of a 12-inch (30cm) saute pan and place on medium heat. Add the meatballs and brown on all sides, turning gently, about 10 minutes. Adjust the heat so the meatballs don’t burn. Tip the pan and spoon off most of the fat. Pour in the wine, and simmer until thick and syrupy. Blend in the basil, sugar, vinegar, and stock. Cover and simmer very gently for 15 minutes, or until meatballs are cooked through. Turn them once or twice during cooking. Remove the meatballs to a shallow bowl. Boil down the pan juices to a thick, rich-tasting sauce. 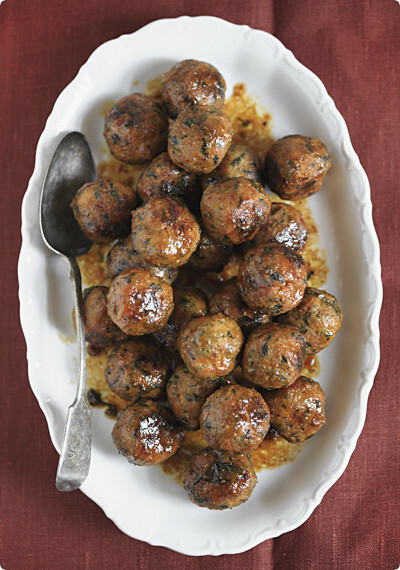 Pour them over the meatballs and serve hot, warm or at room temperature. Each course is better than the last. What a menu… I hope you will share some more of the recipes. Your blog is one of my favorites! Happy Holidays! I cracked up at "3rd: salad???" because I have so written that. Happy menu planning! I can't wait to hear what you pick. Those look pretty amazing. I'm hoping you make the stuffed sardines and share the recipe. That would be amazing, too.Have a wonderful and delicious Christmas! I'm sure whatever you decide to make it will be wonderful. Happy Holidays! Happy Holidays! I love to travel and I love food therefore I love your blog. We have a tradition of western and asian at our christmas dinner. Turkey and all the trimmings and a day's work of home made spring rolls courtesy of my mother. Enjoy! I think you have the menu down. You will make a lot of happy guests. Thanks. The meatballs look particularly amazing… i am definitely going to have to make them asap. – I wont wait for next christmas thats for sure! many thanks for the recipe. This looks awesome. Thanks for a great recipe. Merry Xmas. Happy New Year. Happy Everything Melissa! blows mine out of the water. you always amaze and inspire me, Melissa! hope your holidays were oh so swell. no doubt, this repas magnifique of yours was a tour de force! the meatball lover in me (and all the members of my family) thank you for the above recipe. These meatballs look wonderful! One of my favorites!! Your meatballs recipe is absolutely fantastic…. I think it is not bad to plan my menu for the next Christmas this early. I will definitely start constructing a list so that I will not miss to include this one. Yah, I think that is a good idea. I will change all my usual menus and come up with a brand new list. These meatballs look amazing! I love the usage of spinach in it. I've used parsley several times, but never thought of spinach before. Bet it gives a nice flavor. A must try recipe!